Figure 2. Multiple lesions from Northern corn leaf blight on lower leaf in a continuous corn field in east central Nebraska. Figure 3. Lesion on the V12 leaf in an irrigated continuous corn field in east central Nebraska. 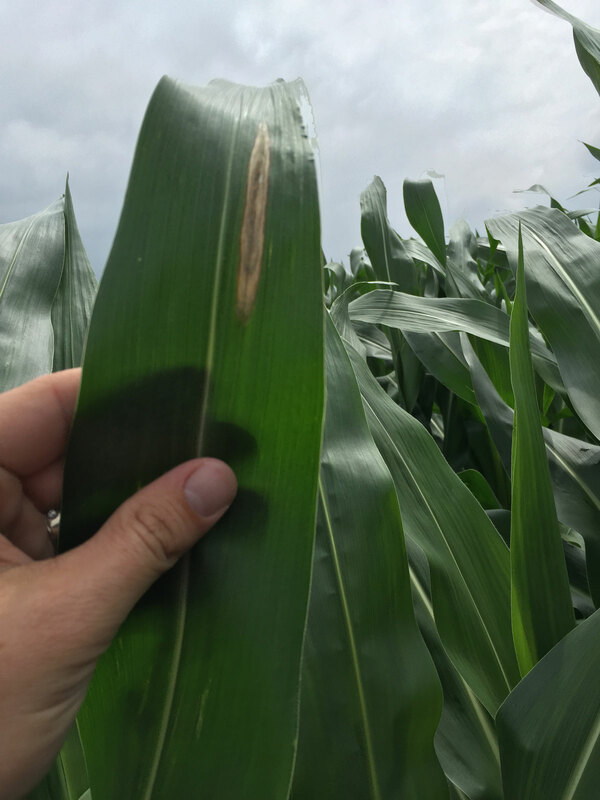 Northern Corn Leaf Blight (NCLB) is continuing to develop in several eastern Nebraska counties. Disease severity varies widely by field, hybrid, and conditions. Disease is not in every field, is at low levels in many, but is becoming increasingly severe in a few areas. 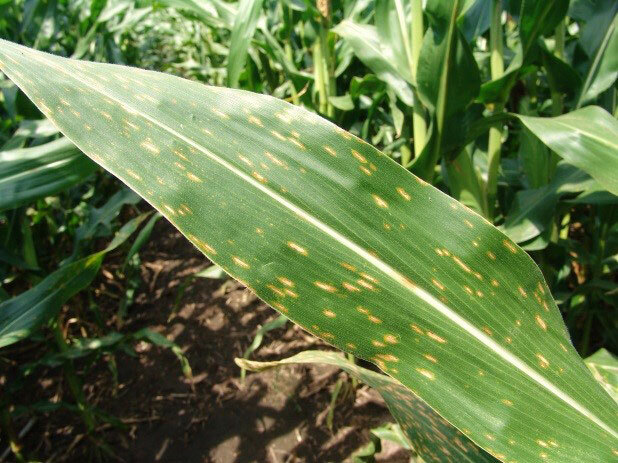 The most severe disease is limited to the highest risk growing conditions, such as susceptible hybrids, continuous corn, minimum tillage, history of local disease, and early onset of NCLB. Some of these fields are pre-tassel and a few may need treatment with a fungicide to avoid yield loss caused by significant loss of leaf area due to NCLB. However, there is no treatment threshold for this (or most) diseases. Treatment decisions should be made considering all of the risk factors in each field and assumption that disease may likely continue to worsen later in the season, possibly needing treatment then. The worst NCLB appears to be mainly limited to a few counties in eastern Nebraska. 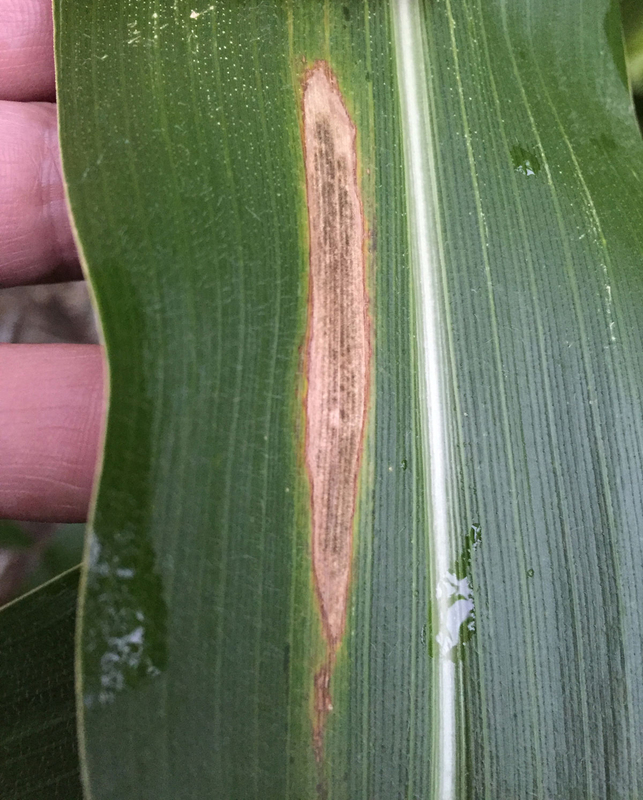 In several east central counties, where the disease first became visible two to three weeks ago, disease severity has been increasing in some high risk environments. Lesions have not been observed in corn planted after alfalfa. However, some NCLB lesions can be found in numerous no-till corn fields that followed soybeans (Figure 1) and more prominently in corn following corn where a susceptible hybrid was planted (Figure 2). In higher risk growing conditions, the disease has spread within the corn canopy to upper leaves (Figure 3). Hybrids with both low to moderate ratings are being impacted in these environments. Other diseases, such as Gray Leaf Spot (GLS), are also developing. As a reminder, GLS is also caused by a fungus (Cercospora zeae-maydis) that survives in infected plant debris from the previous season(s). It consistently begins on the lower leaves and continues to move higher on the plant as long as weather conditions are favorable. This disease is favored especially by temperatures of 70-90°F and periods of 12 or more hours of very high relative humidity in the canopy (>90%). GLS lesions begin as yellow flecks that expand to rectangular gray to tan lesions between leaf veins (Figure 4). Severity of symptoms is evaluated by the amount of leaf area covered by lesions and how high on the plant they have reached. 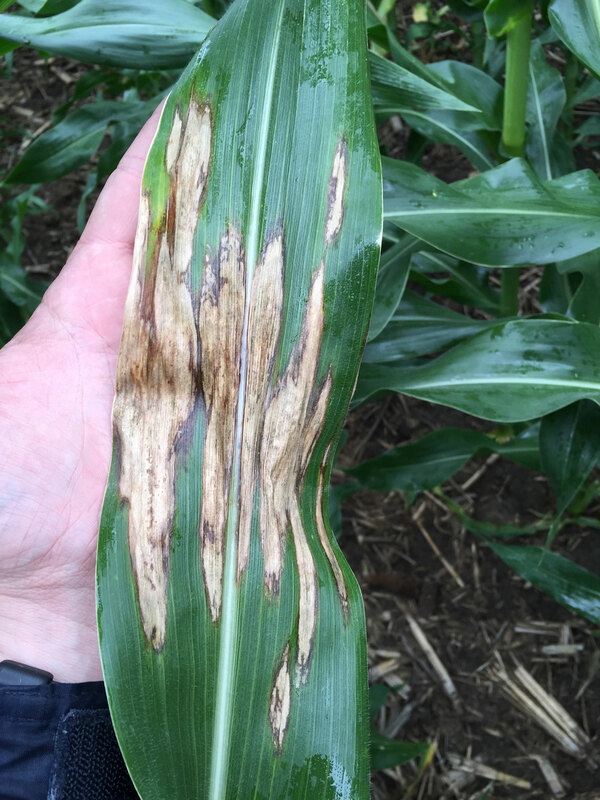 Lesions may take as little as 14 days to develop in susceptible hybrids and up to 28 days to develop in more tolerant hybrids. At this point, GLS lesions are largely limited to the lower corn leaves and are less threatening to yield. Keep in mind that conditions are often more favorable for GLS later in the season after tasseling when the disease tends to increase in severity more quickly. The same high risk factors for NCLB also apply to GLS development. GLS has been the predominant disease in fungicide trials conducted at the UNL South Central Agricultural Laboratory during previous years. When they were needed, applications made at tasseling and soon thereafter have most consistently provided yield returns under significant disease pressure. In addition, applications made after tasseling of most products provided improvements in standability (in push lodging tests) compared to the nontreated control during several trial years. For more information see Highlights from the 2014 UNL Corn Fungicide Trials or fungicide trial results from previous years in the Corn Disease Management section of CropWatch. Scout fields regularly to identify diseases and monitor their development. Familiarize yourself with the high risk disease factors and in which fields they occur. A number of bacterial diseases are also active this year and could be mistaken for fungal diseases. Make sure you correctly identify the problem(s) before developing a management plan. If you are unsure about the identity of these or other diseases, you can submit samples to the UNL Plant and Pest Diagnostic Clinic. Sampling instructions and sample submission forms can be found in the Plant Disease Management section of CropWatch. See results from UNL Corn Fungicide Trials.